Henry Katz and Company was founded by Henry Katz in 1928 as a toy company. Katz became famous as the creator of the one dollar electric train and the one dollar transformer during the Great Depression. The firm produced a few low priced yet attractive lithographed electric trains in 'O' gauge, as well as a larger tinplate floor train. Other products produced included a multitude of tinplate airplanes and 3 complex and elaborate operating mechanical mini landscape toys that featured moving trains, cars or characters. Henry Katz had learned the ropes of the toy world working for the famous Ferdinand Strauss toy company from 1917 to 1928. When he first started there, he was 14 years old. Katz is credited with the design of the 'Dizzie Lizzie' while with Ferdinand Strauss, as he had spent time in the production end of the business. But Katz preferred the sales side of the toy business. He was born in New York City, and had been a boyhood friend of Louis Marx. Katz & Co. made toys for a brief period of only 22 months, between 1928 and 1931. The Henry Katz toys were quality products that consisted of lithographed tin. Production took place during a time when many of the European toy companies such as Bing, Karl Bub, Hornby, and Märklin were producing marvelous and beautifully-crafted toys with this method. Lithographed tin was simply the process of printing graphics, such as text, numbers and logos, on a metal such as tin, using paint. In 1929 Katz & Company offices were located at 215 Fourth Ave, New York, NY. Other offices were housed at 200 Fifth Ave. which was the toy center of that era. Over time the company grew to have five locations, the first and principal plant at 330 Chestnut Street, Newark, New Jersey. The other plants were located in Girard, Pennsylvania, Waterbury and Forestville, Connecticut, and the office in Manhattan at 215 Fourth Avenue where Katz conducted his business. 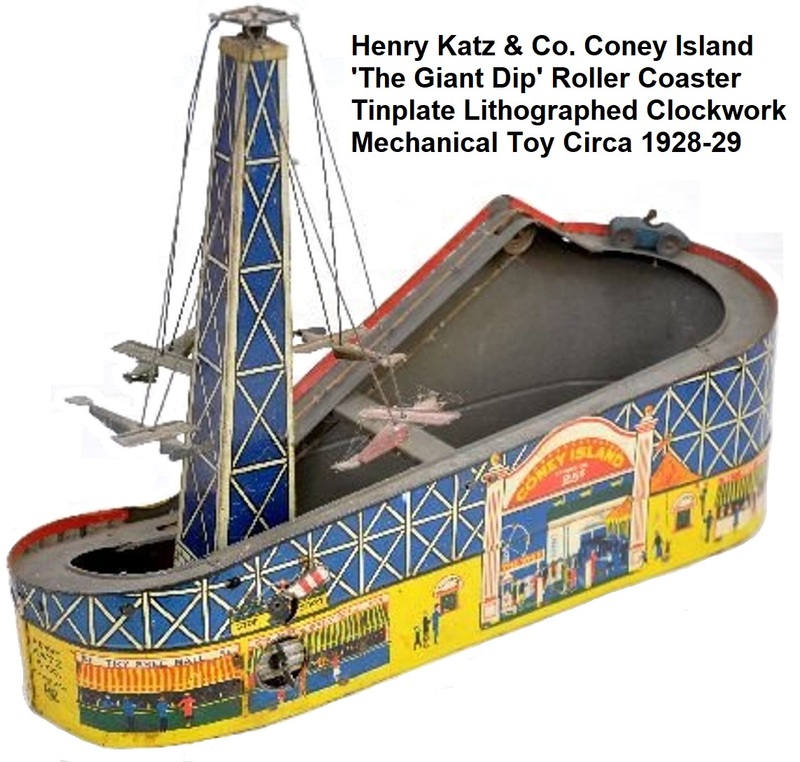 Henry Katz & Co. Inc. had been in business for only a month when they produced one of 20th century America's most spectacular tin toys. This was the lithographed tinplate, mechanical 'Grand Central Station'. The toy was unique in that it featured four train tracks with two stamped metal trains of three cars each running in continuous movement via strings and a key wound clockwork motor. The trains travelled from one end to the other passing through four tunnels. A semaphore switch located between track tunnels 1 and 2 controlled the start and stop action. An attached key located just above the semaphore was used to wind the clockwork motor. In the center between the two trains stood a pair of two dimensional Red Cap porters, globe light poles and a baggage cart. 1928 New York City scenes which included several stores, commuters, various autos and even a double-decker sightseeing bus were lithographed onto the building sides on either end. The front of the building was easily recognizable by the large roof clock and the Grand Central logo. On the bottom side of the toy were four pulley caps and three rubber O-rings. It had three polished tin cross support brackets. The tinplate platform with station tunnels was 16" long. The toy originally sold for $1. Henry Katz was most noted for making trains affordable while with Katz Toy Co. He made whole train sets for sale under 1 dollar to buy new. Starting in 1928 he produced the Five Fifteen Limited which was an 'O' gauge electric train set. This became one of his most popular products and was named for the train most homebound New Yorkers tried to catch at the end of each work day. In looking back on the name, Katz thought it was a natural because of the congested rush in the 1920's to catch the 5:15. That product was initially made at both the Newark and Waterbury plants, and despite the fact it was the beginning of the Great Depression, Henry Katz & Co., Inc. was testing the waters of the toy business and prospering. Henry Katz designed most of his own products and made most of the components himself, including the can motor in the #515 engine. Katz's genius as a businessman was also evident from the start. He was determined to be successful and refused to give in when most businesses at the time suffered from financial disaster and finally died. "We explored new fields," Katz said in a 1952 interview, reflecting on doing business during the Depression. Katz's answer to the Depression was to "build as much as you can at as low a price as you can." He realized that the people of the time didn't have much money to spend for toys because the bulk of their money went for necessities like food - bread lines were commonplace during the Depression. While Katz contemplated how to succeed he looked at what his competitors were doing. Lionel had the largest share of the toy train business, but Katz realized Lionel's cheapest line sold from $7 to $9, and then added to the cost of an inexpensive transformer another $3.75 or more. That gave Katz an idea - why not make a train that sells for $1? Better yet, make a train and a transformer that sell for $1 each! His idea worked and provided strong competition for Lionel's products. Katz continued to target his products toward the lower-middle to lower class market. Times were hard and yet Katz felt it was important to make electric toy trains affordable so that parents could purchase a fun toy for their children, to take away from the deadly seriousness of just getting by day after day. Katz, always the consummate businessman, felt there was room for another toy train company because he'd already watched the classier and higher-quality train companies, such as Dorfan and Ives, disappear, victims of overhead and other difficulties. The risk was great, to be sure, but Katz's entrance into the market at that time in history showed the fortitude and pride of the people of a progressing nation. That Five Fifteen Limited $1 train that Katz manufactured was a very simple toy train. The first train set consisted of an engine and a passenger coach, both labeled 'The Five Fifteen Limited'. Each piece was lithographed in red, yellow, and black with cut out windows. The train was constructed from a single piece of folded sheet metal. The engine was easily distinguished from the passenger coach by a cow-catcher, and in later varieties, by a light and pantograph. The engine, because of the way it was constructed, does not have steps or side doors to enter the car. The engine has three windows on each side, while the passenger car has four. An original boxed set shows that Katz made track for the train. Four sections of track were included in the set to form a small circle. The fiber tie track itself was curved and one section of the track had a clip to attach a wire and hook up to either a transformer or dry cell battery for power. Initially the two piece set was offered with an 18 inch diameter circle of track. The small circle of track could hardly accommodate more cars comfortably. There was also a detrack. This conventional track was used by other toy train companies at that time. Directions for making the electrical track connection appeared on the reverse of the original box. There was also a diagram showing the layout and a picture of the Katz trains on the track - further evidence that one engine and one car made up the complete set. Over time, improvements were made with the hope of increasing the quality of the train enjoyment of customers, and, of course, company profits. A deluxe version of the train, with 2 coaches was made. Even though this deluxe set retailed for $3.95, it was still considerably under the retail market price of competitors and sold very well. This deluxe set was part of a deal with the Mattatuck Manufacturing Co. of Connecticut. Katz and Mattatuck collaborated to produce this deluxe model of the Five Fifteen Limited. In 1929, because of the Depression and a decrease in sales, the New Jersey plant of Henry Katz was closed and manufacture of the Five Fifteen Limited was moved to the Mattatuck Manufacturing Company plant in Connecticut. The deluxe set included a transformer which also served as a powerhouse. 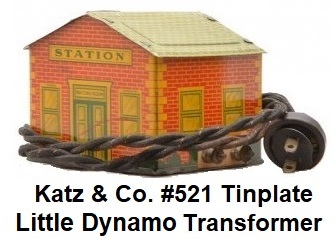 This lithographed transformer, #521, had the trade mark name of the 'Little Dynamo,' as well as carrying the logo with two red kittens around the words Katz Toys. The transformer was lithographed in red, yellow, and green and resembled a little brick train station with the word 'station' printed on one side. The instructions on the reverse side of the original box shows an alternative for household electricity by using a dry cell battery. Again, just another attempt by Katz to make his product accessible to a wider market. Although manufacturing statistics were not saved, according to Katz, "we had a production run of 100,000 to 200,000," which in those days constituted a pretty good run. Think about it - 100,000 to 200,000 toy trains. Yet today these trains are very scarce, as these trains were sold and played with and not acquired as collector's items. Katz limited his electric train production to the Five Fifteen Limited models. The first Five Fifteen Limited was made in 1928 and the deluxe model went into production in 1930-31. "I was always a kid at heart and liked trains in my youth, that's why I gravitated to them," he said. "My son was always fascinated with trains and when he was a youngster I used to buy him layouts and Lionel setups. Then, when I brought this thing out (the Five Fifteen limited), he used to get a bang out of that little train." Katz said his son particularly liked the third rail where the train made contact. He often turned out the lights to get a thrill from watching the sparks fly! That may be part of the reason he never wanted to make a wind-up train. 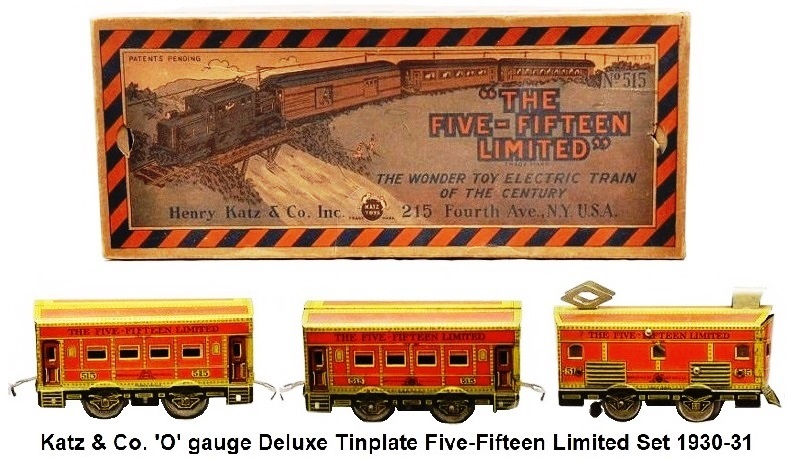 The deluxe Five Fifteen Limited set included the same Five Fifteen limited style of train except the engine contained a light and pantograph, an additional passenger car, and a lithographed transformer. Katz said that when he expanded his first set, he added the second car with more track, straight and curved, as well as a 45 degree crossover. Katz dressed up the deluxe set by making the cars a little heavier, which accounted for the stronger more durable underbodies. Katz then started to use conventional 3-rail tubular track, replacing the lighter fiber tie versions. In an interview Henry Katz said, "We eclipsed the competition's wind-up trains by going to something electric," adding that his main competitors at the time were Lionel and American Flyer. Variety 1 Engine: It has no headlight, no pantograph and long wire stems holding the can-type motor. There are no rivets to block the number 5 in 515. A round coupler connects to the passenger car and a crude curve piece of metal protrudes from the bottom of the engine to make electric contact with the track. Variety 2 Engine: It has a front headlight with a rear pantograph (associated with the deluxe Set). There are short wire stems holding the motor (these may have been cut by the train's owners for convenience). There are rivets blocking both 5's in the number 515. A hook coupler fastened to the underbody replaced the round one and a metal roller is used to make electric contact with the track. Variety 3 Engine: This is the same as the Variety 2 engine except the pantograph is without a crossbar. There is no indication that one was there before and has been broken off. Variety 2 Passenger Coach: There are holes on the sides/steps with a solid underbody added to provide greater stability appearing with the deluxe model. The Type 2 coach is most often found with the Type 2 or 3 engine. The Variety 1 types were the earliest designs produced by Katz. Improvements and changes which helped to increase the chance of success came later with the second varieties. Market share was probably on Katz's mind. With some patents still pending, the company exited its brief, approximately four year, existence as a toy company. 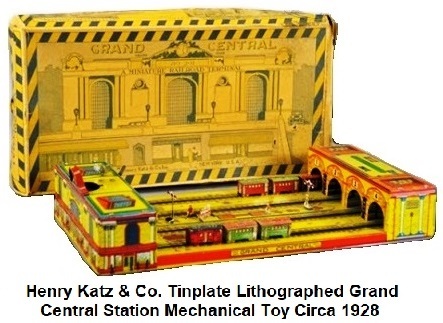 In addition to toy trains, Katz manufactured his own unique line of tinplate toys. Profit in the toy industry made for eager competition. He produced 'The Giant Dip' Coney Island roller coaster in 1928 and 1929. This mechanical toy featured one or two cars that followed the simulated roller coaster track. The cars were attached to a moving cable, much like a real roller-coaster, that would draw it up to the top, and using the laws of gravity, down it would come. This item also featured a tower structure with 4 airplanes attached by strings. The planes would circle the tower when the clockwork mechanism was released. This elaborate toy retailed for $1. In 1928, "One of the most important items that we made was the Spirit of St. Louis," Katz said in a later interview. In 1927 Charles A. Lindbergh had made the first transatlantic flight to Paris. Many units of this toy were sold as a result, making it a big success. It retailed for fifty cents and was a mechanical wind-up reproduction of the Spirit of St. Louis airplane in silver. During 1929 Katz produced a Marching Parade of Soldiers (Big Parade) for fifty cents retail. In those days, a $1 toy was considered high priced, the top of the market. Remember, these toys sold during the time of the Depression when an apple sold for 5 cents. Another popular item was the three coin bank of 1928 and 1929. Katz was the first company to manufacture a three-coin bank, which included the nickel, dime, and quarter. It retailed for $1, was made of steel, and it operated by putting a coin in the appropriate slot at the top. There was a lever to pull down which registered the coin. The bank registered up to $10.00, and when it was full it opened automatically. Even though it was a toy bank, many adults thought it to be a good thing to have around. Katz said, "They would shop and, if they had any change, they would put it in the bank." Katz wasn't only thinking of boys, but also girls. In 1928 and 1929 he introduced the first toy sewing machine which was an actual functioning machine. It had a hand wheel, and as the wheel was turned the machine would produce a chain stitch. Katz didn't attempt to go into a more difficult lock stitch. The sewing machine used a standard Number 18 Singer Sewing Machine Co. needle. The Grand Central Station toy mentioned earlier was a cable train. Actually, they were miniature trains or autos with a cable underneath and attached to the vehicles. These had wind-up motors, and were attached to a cable cord. The direction of the cable train was determined by the shape of the slots. The Grand Central included two sets of operating trains. The Union Depot, "My own personal brainstorm," said Katz, was an adaptation of the Grand Central. It was the Grand Central with cross traffic on the side. Katz also made an airplane called the Question Mark. At that time the United States experimented with a trimotor, a mechanical job which was the first aircraft able to load fuel while in the air. It received a lot of publicity. Katz's toy was a black and gold job, which were the actual colors of the Question Mark. Katz was prudent, taking advantage of the favorable publicity. Henry Katz & Co. was also noted for producing big, quality floor toys. Sometime around 1929 Katz marketed a large tinplate train set as a floor toy. It measured 49 1/2 inches in length and stood 8 inches high. It was made of durable tin with a bright gloss orange and gray finish featuring red lithographed rivets and numbering. A complete set consisted of an 0-4-2 steam outline locomotive numbered #340, tender numbered #341 and hopper numbered #342. There is no information available that indicates other cars were produced for the set before the company went out of business. Since the company was short lived, there was limited production of Henry Katz toys, particularly these larger floor train toys. In the early 1930's Katz organized the Henry Katz Selling Organization. This led to his alignment with numerous toy companies. Among his early clients was Hafner Mechanical Trains which lasted until the outbreak of World War II, when restrictions on the use of steel stopped production. Henry Katz & Co., Inc. closed its doors in 1931. In a later interview Katz explained, "The banks were failing right and left and I was on the road at that time issuing checks while the banks were busting. So the checks would bounce." Katz's source of funds was literally cut off and with it so was his business. The patents which were pending, however, were issued, some while the company was in business and some after. When Katz closed in 1931, he received an opportunity, or proposition, from the Mattatuck Manufacturing Co. of Connecticut and moved to the Hoge Manufacturing Co., Inc. He arranged for them to buy some of the old Katz tools. He operated their toy division which lasted three or four years. In comparing the Tom Thumb series of the Hoge line with the earlier Katz line, one can see the Katz influence. The Hoge low end trains are obviously similar to the Katz trains. Hoge even issued a transformer placed into a tinplate lithographed building called the Powerhouse which was almost identical to the Katz & Co. Little Dynamo Transformer. Katz then decided he would take on some other lines, so he represented the Hafner Manufacturing Co. which made popular mechanical trains such as the Overland Flyer. Katz said, "I gravitated in that direction and I represented them for several years." Katz later started another phase of his long career in the toy industry with Buddy 'L' as a sales representative. The Buddy 'L' Company was the first to bring out toys made of automobile body steel. These toys were virtually indestructible. Buddy 'L' was started in 1922 by Fred Lundahl. Lundahl previously worked for the International Harvester Company making fenders. The leftover sheers of metal from these fenders became the material for the toys he made for his son, known as 'Buddy'. The first thing he made was a dump truck. Next, he made his son a steam shovel. Lundahl is credited for conceiving the idea of the first hydraulic toy dump truck. It operated by pressing a button which lifted the body of the truck by the hydraulic pressure. This was the foremost line of steel trucks for the company, which Henry Katz was representing at the time. The Buddy 'L' Company was financed by the Bettendorf interest from Iowa. There was a town in Iowa known as Bettendorf, which was right outside of Davenport. Katz saw the meteoric rise of the Buddy 'L' Company and when the opportunity to represent them presented itself, along with already representing the Hafner Train Company, he became the Buddy 'L' manufacturing representative. Eventually, Katz purchased Buddy 'L' from the Molene Manufacturing Company in 1941. Katz guided Buddy "L" through the war years by producing wooden toys (Buddy 'L' Victory Toys). After the war years Katz went back into regular production of Buddy 'L' steel toys. Katz retired in 1980 and his son, Richard L. Keats, took over as President of Buddy L Toys and the Buddy L Corporation in Manhattan. Henry Katz passed away in 1988. His contributions in the field of toy trains includes his production and manufacturing years with his own Katz & Co., his association with the Hoge Company, his sales representation with Hafner, and his management of Buddy L.
Although any Katz train is considered rare today, the Variety 1 types of the Five Fifteen Limited appear to be the scarcest. The demand for Katz trains is small due to the lack of information about the company and its availability to collectors. Prudent collectors can still acquire a complete set at affordable prices. Katz toys typically do not yield high values at auction which is unusual considering the rarity and the age of these toys when located. It is not unusual to find these toys in their original boxes. 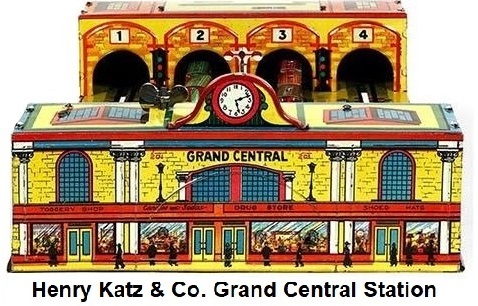 In November of 2009 a Katz Grand Central Station tinplate lithographed clockwork toy in like new condition sold for $2,049.00. Since Henry Katz only had his company for 3 years, a short time in the toy industry, he naturally didn't make many toys. However, his toys were well made and did last a long time.